The Iranian regime advocates for a policy of appeasement. 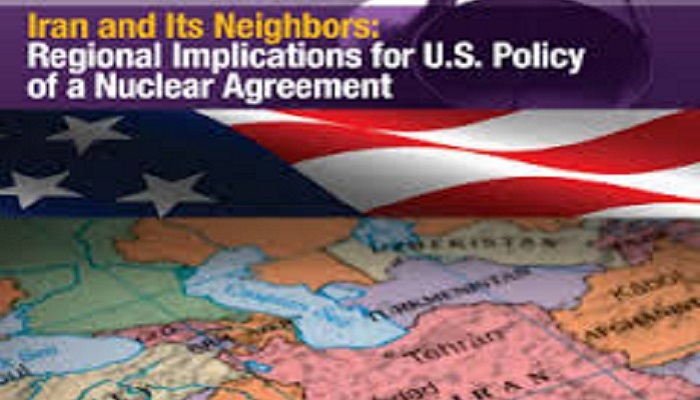 Recently The Iran Project, a collection of former U.S. government officials, issued the fourth in its series of papers devoted to the topic of improving relations between the U.S. and Iran. In it, these former government policy wonks detail the state of Iran’s relationships with its neighbors. In earlier papers they had examined diplomatic, economic and military aspects of the nuclear issue involving Iran. It is an appropriate quote for The Iran Project since one of the great failings in logic in its approach to the question of how to deal with Iran is the assumption that Iran can be steered towards an amicable accommodation with its neighbors and the West. That is based largely on the belief by these former officials that diplomacy is the cornerstone of any agreement and thus “talking” is the process by which to secure a more peaceful future for Iran and its neighbors. But Groucho had one over these guys when he rightly jokes that the ever fluid nature of politics is built largely on deception and the management of perceptions, both internally and externally. In Iran’s case, its leaders have carefully crafted a script in recognition of their perennial adversary’s weaknesses. Those weaknesses are the current Administration’s deep-seated and vocally stated desire to secure a deal with Iran and an isolationist withdrawal from Middle East affairs after the wars in Afghanistan and Iraq. The paper’s authors make the same fatal mistake that diplomats have made from Chamberlain at Munich to King Priam at ancient Troy which was to underestimate their opponents by thinking they were rational people. To discuss Iran’s relationship with its neighbors and the West as whole must begin and end with one thing: Iran’s status as a theocratic state with meddling in other countries through export of terrorism and fundamentalism as a pillar of survival. Within the sphere of diplomacy, it is an oft aimed for goal to find common ground and then build a mutually beneficial agreement. Unfortunately, when one of the parties is a religious theocracy that derives the formulation of national policy based on a personal interpretation of a higher authority, and depending on expanding its influence in the region by spreading extremism to compensate and cover up its popular isolation and growing schism within the ruling elite, it leaves little wiggle room for accommodation. Since the 1979 Revolution, Iran’s government has been co-opted by a cadre of mullahs and clerics who have fallen into the age-old trap of all would-be revolutionaries; the intoxicating effects of power and wealth. The clerical councils grip on power through the military and judicial branches of government have evolved into a death grip that Western diplomats have failed to appreciate fully, especially during nuclear negotiations that began shortly after Hassan Rouhani assumed power. During these negotiations, Western diplomats and media have also been snookered by a skillful media and PR campaign by Iran branding Rouhani as a moderate and the Islamic nation firmly committed to finding a peaceful solution to the thorny nuclear question. But the past year has demonstrated clearly no dividing line exists between perceived moderates and hardliners in Iran. In fact, Iran’s core political establishment is firmly hardline and hostile to the West and its neighbors and subservient to the religious establishment. This has been put on ample display by the spate of human rights violations designed to stifle public dissent. Continued diversion of funds to foreign military activities in Syria, Iraq, Afghanistan, Lebanon and Yemen and support for terrorist groups such as Hamas and Hezbollah. The centerpieces of Iran’s national policies have been the commitment to its nuclear program and the aggressive support and promotion of its particular brand of radicalized Shia religious sect, both of which have been largely ignored within The Iran Project’s analysis. The analysis prepared in the paper urges the U.S. to mount an aggressive effort to reassure Iran’s neighbors of its commitment to regional security, but it leaves out just how those neighbors can be reassured when Iran makes no effort to give up on its efforts to influence its neighbors directly through military intervention as in Syria or through proxies as through Maliki in Iraq and more recently in Houthis in Yemen. This question vexes the Sunni Gulf States and Saudi Arabia the most since Iran’s mullahs have made no suggestions they will abandon their efforts to spread their brand of fundamentalism across the region. Reiterating time and again that in addition to its repressive theocratic ideology, the clerical regime in Iran cannot survive without expanding its tentacles in the region is not an overstatement. An interesting note is the position taken in the paper that Iran should develop its energy and natural resources. It implicitly advocates for the U.S. to take a greater role in developing Iran’s infrastructure for the purpose of offsetting Russia’s influence in Europe; a position that seems naive at best and dangerous at worst. But at no point is there an answer of reconciling Iran’s rigid and strict Islamist rule with pluralistic democracies in the West. Are we to assume that Iran will be the next China and the West should ignore crippling human rights violations in favor of the almighty dollar? Iran is not China, since it considers normal relations with the West as a cultural onslaught against its rigid and theocratic approach. The paper also positions Israel and Turkey, the U.S. closest allies in the region, as being willing to accept a reduction in their own security in favor of an Iranian deal. Also assumptions not largely rooted in the practical reality of the world. The Nobel Prize winning economist Paul Krugman recently listed Ronald Reagan as one of the most consequential Presidents of the modern era. What made Reagan effective as a leader was the unwavering nature of his world view, especially towards the old Soviet Union which he openly named the “evil empire” much to the chagrin of the foreign policy establishment. But it was largely through Reagan’s commitment to that vision that the world saw the eventual fall of communism and the radical redrawing of Europe. What the U.S. and the Middle East, especially Iran’s neighbors, need now is a similar commitment to singular vision. That vision must be aimed with laser-like precision at Iran’s leaders and the eventual solution of regime change. Only in that way could the West be reassured of Iran’s commitment to peace. An essential element missing from the paper’s analysis is the problem of Supreme Leader Khamenei. As Iran’s spiritual and titular head of state, all foreign policy decisions, including approval of all treaties, must pass through him. One would think if Iran was truly committed to a lasting resolution to the nuclear impasse, Khamenei would voice support for a solution and ongoing negotiations. Instead Khamenei went on a much publicized series of public rants where he explicitly and forcefully reiterated Iran’s commitment to its centrifuge capacity to enrich nuclear material and to its missile development program to deliver warheads. Khamenei’s statements were the primary reason why nuclear talks in July failed and the new deadline for another round set for November. Given the vigorous support within Iran’s clerical circles for a nuclear capability to offset the perceived strategic advantages that Israel and Saudi Arabia possess militarily, it is hard to imagine Iran willingly giving up its capability, let alone actual weapons. The US misguided policy gave Iraq to Iran in a silver platter, to detriment of not only the Iraqi people but the whole region. As a matter of fact the trend in the past few months have been very much moving to the Ayatollahs’ detriment. As the time Tehran’s strategic deadlock on two key issues is becoming more evident. It suffered a strategic blow in Iraq. It is desperately trying to regain its foothold in Iraq. On the nuclear front, the snooze is tightening up on Tehran’s neck. Now it is time to turn the heat on the regime. Allowing the Ayatollahs off the hook and providing concessions is a grave mistake of mammoth proportions. Iran has very little incentive to cut a deal when it is already getting pretty much what it wants while still developing its nuclear program. Iran’s mullahs have also judged that the U.S. and West are much more in need to winning political points than they do at home and as such can hold out far longer. While the reality is that the regime in Tehran is much more vulnerable. The mullahs and their lobbies in the West work hard to portray the opposite. Another aspect is that the regime’s PR machine in the West has made a concerted effort to propel the myth of a divided Iran with a populace eager to support Western engagement. The truth has been the complete opposite and while the bubble of Rouhani being a moderate has burst, it is becoming a harder sell for Tehran lobbyists and apologists. Ultimately the only real solution for Iran’s nuclear challenge is to follow the example laid down by President Reagan in his dealings with the Soviets which is to deal from a position of strength bolstered by a firm commitment in a singular vision. That vision should be a nuclear-free Iran and negotiations should accept nothing less than the complete dismantlement of its entire nuclear infrastructure, including centrifuges. Coupled with that must be a political liberalization that finally forces its mullahs to relinquish power in favor of a pluralistic, democratic government. Without it, no agreement reached with Iran can stand the test of time.